We just wrote up Fujifilm’s CES lineup of normal point-and-shoots, and I noted that there was no sign of the interchangeable-lens X-series camera we saw leaked in prototype form a while back. I expected it to show at CES proper, but it seems that Fuji didn’t want to spoil the surprise by putting the news out early. Luckily for us, someone else did! French photo magazine Réponses Photo has gone to press with an article on the new camera, called the X-Pro1, and a few sweet new lenses. The details are more or less as expected: 16-megapixel APS-C CMOS sensor, a revised hybrid viewfinder (i.e. improved over the already-excellent one in the X100), and it’s making its debut alongside three fast primes: a 18mm f/2, 35mm f/1.4, and a 60mm f/2.4. This camera is really intriguing me. With the improvements to the X100’s setup, a variety of lenses, and a bigger sensor than the X10 (which I liked a lot), this is looking like a real photographer’s camera. 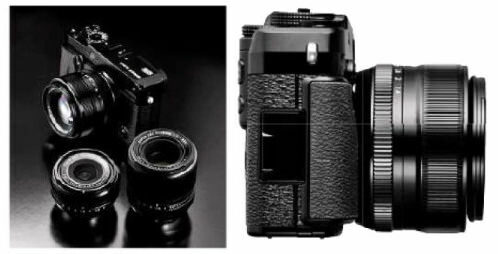 I don’t expect it to be affordable, though; Réponses Photo estimates 1300 Euros for the camera and 35mm as a kit. That’s full-size DSLR territory, not to mention the coveted NEX-7. We still expect to see this thing in person at CES, so be sure to keep an eye on our coverage there.